The crochet bag in summer is really a must-have! There are various types, but they are always beautiful to wear and out of time. 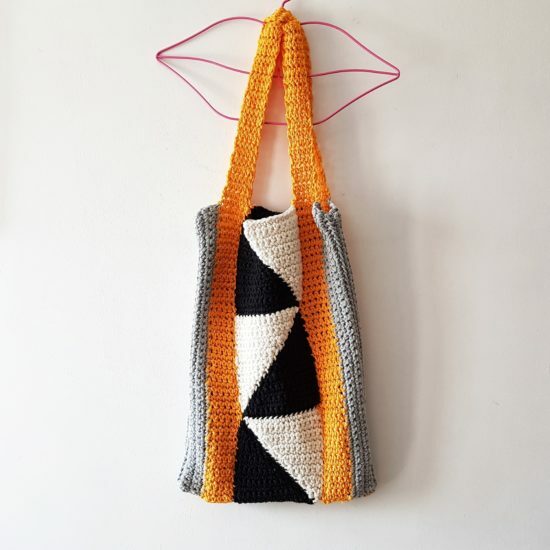 Here is a Free Pattern for you, designed exclusively for Bettaknit by Liliana Buce of @knothing_usual, to create a crochet bag in color blocks. 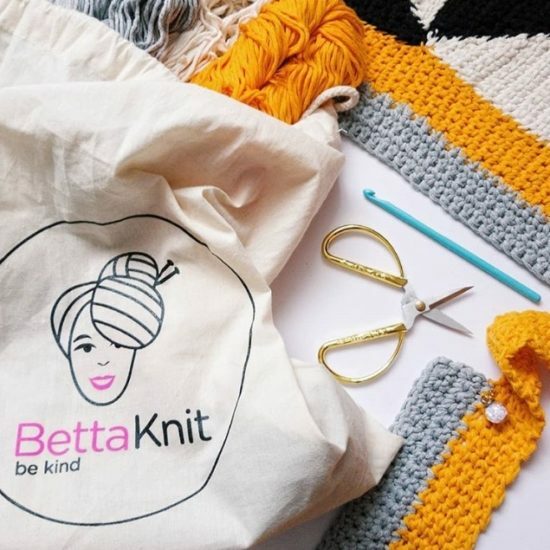 What will you need for your crocheted bag? 5 skeins of 100 gr of Prato Cotton, our 100% recycled cotton yarn (Do you remember? Look at this post!) in the following colors: 2 skeins color Corn, 1 skein colore Black, 1 skein color Ecru, 1 skein color Pearl. 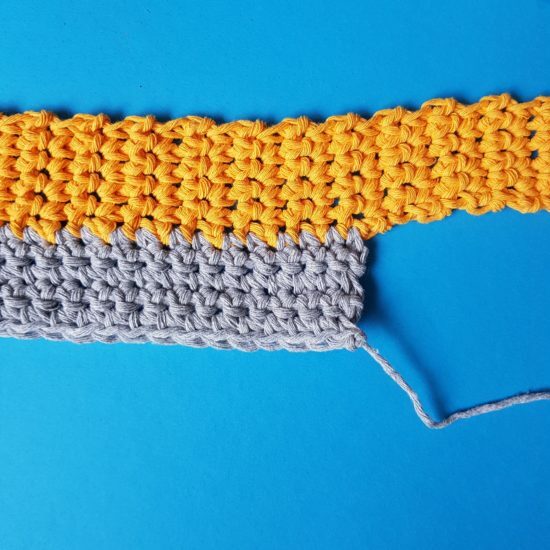 The pattern level is intermediate, but we are sure that with the help of our video tutorials you will succeed even if you are a beginner! Chain (ch), do you remember how to do it? Here our blog post! Slip Stitch (slst), for a review look here! Everything is ready to start, just missing a sample so as to make sure you get the same result. In a 10×10 cm square, 11 m.b. x 12 rows. The finished bag instead will measure approximately 30 cm of base x 42 cm of height (excluding the shoulder straps). The front and back panels are made of a series of triangles, that will be joined together. 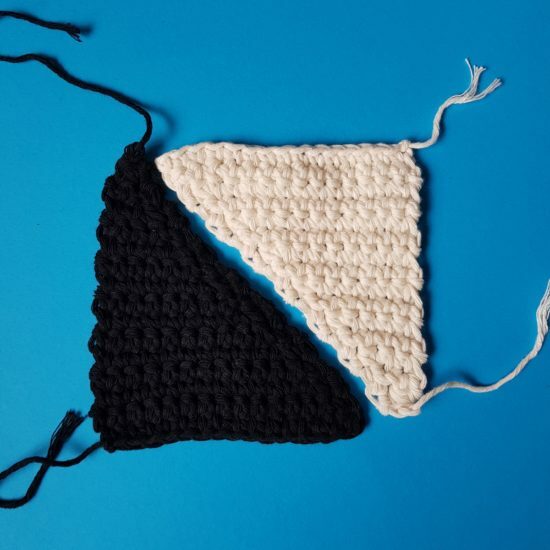 For this reason, repate the following instructions 12 times: 6 times in Black color, 6 times in Ecru color, so as to obtain as many triangles. Once all 12 triangles have been made, they must be assembled to form squares. 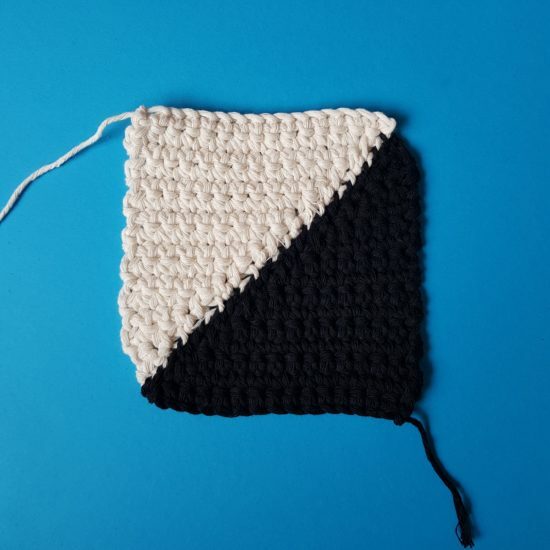 Then, place 2 triangles (one ecru and one black), so as to form a square. Make sure the foundation chain is at the top and at the bottom of your square: it will help in the seam. Then sew the triangles together along the diagonal. Repeat the procedure for the other triangles: 6 squares will be obtained. Join them together: 3 for the front panel, 3 for the back panel. Repeat the following instructions twice, to make both the shoulder straps. 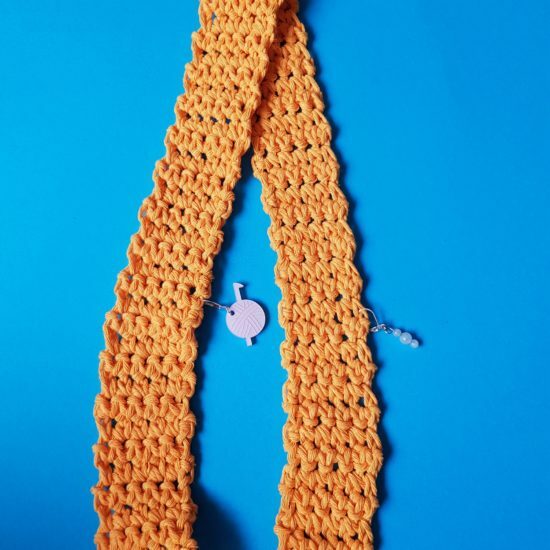 Taking one of your long straps, place a stitch marker on the 45th row from the beginning and a stitch marker on the 45th row from the end. You will work on the sides of the strap. Now take your strap and place both ends on the sides of your squares. Sew on both sides. 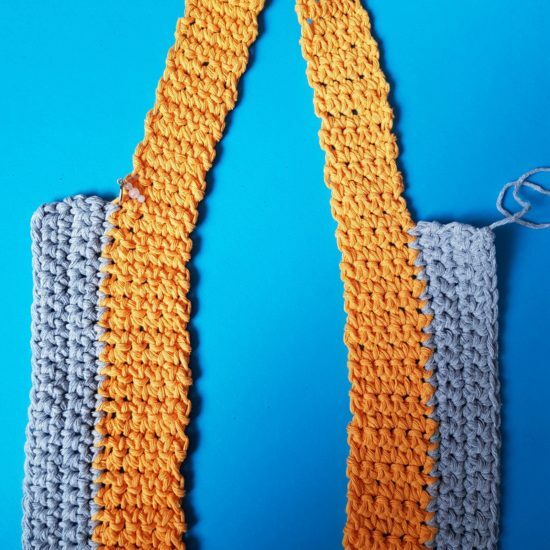 At this point, repeat the procedure with the second shoulder strap, then using the second group of squares. 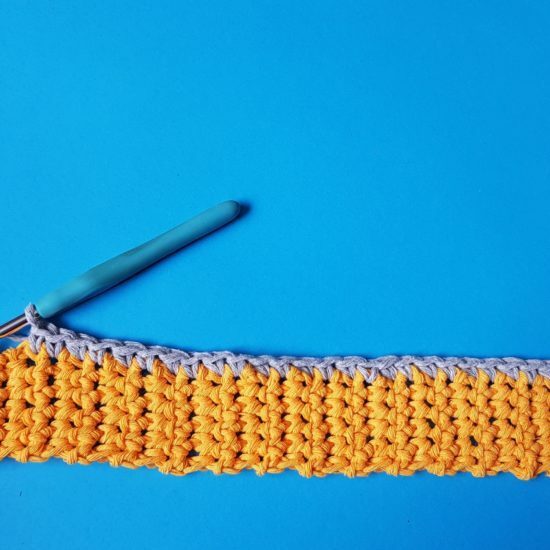 Sew both panels together on the sides and at the bottom using your needle. Weave in all loose ends. 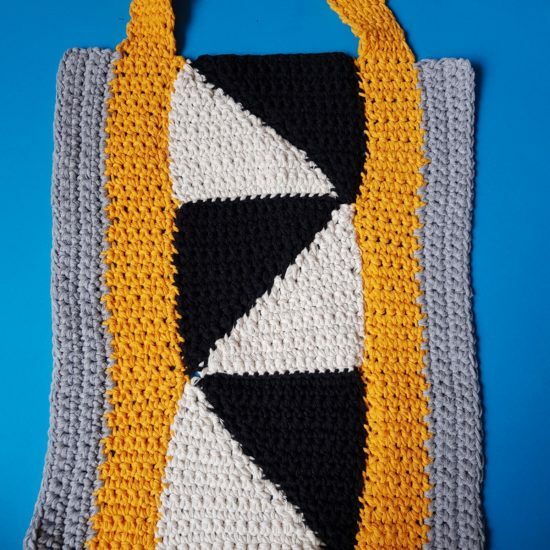 Now your Crochet Bag in Color Blocks is ready!